A couple of son in laws from my extended family are staying with us at the moment. 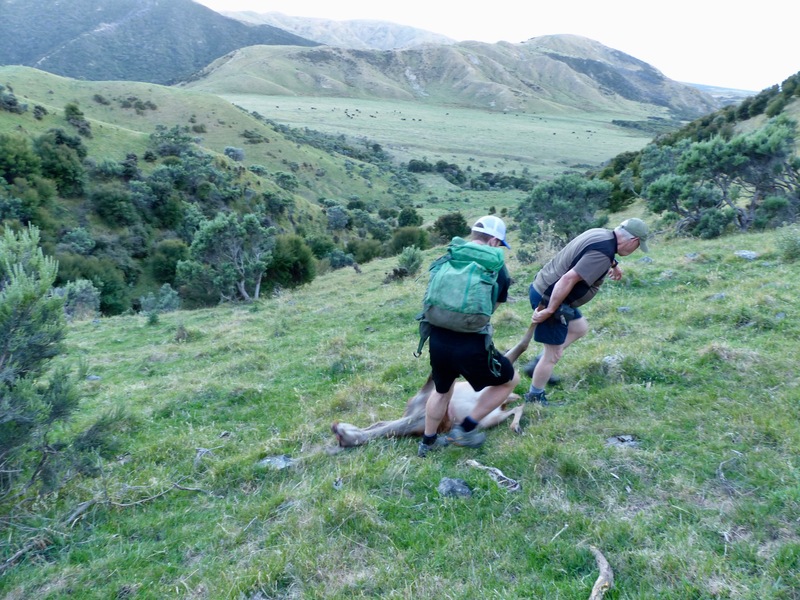 One is from up in the Nth of England and is a keen outdoorsman and the other from Auckland. Neither have ever hunted or fired a rifle but both are fit young men. I gave Sam a few dry firing lessons and some serious safety lessons and instructions in our lounge and packed the pair of them into my truck for an overnight hunt. 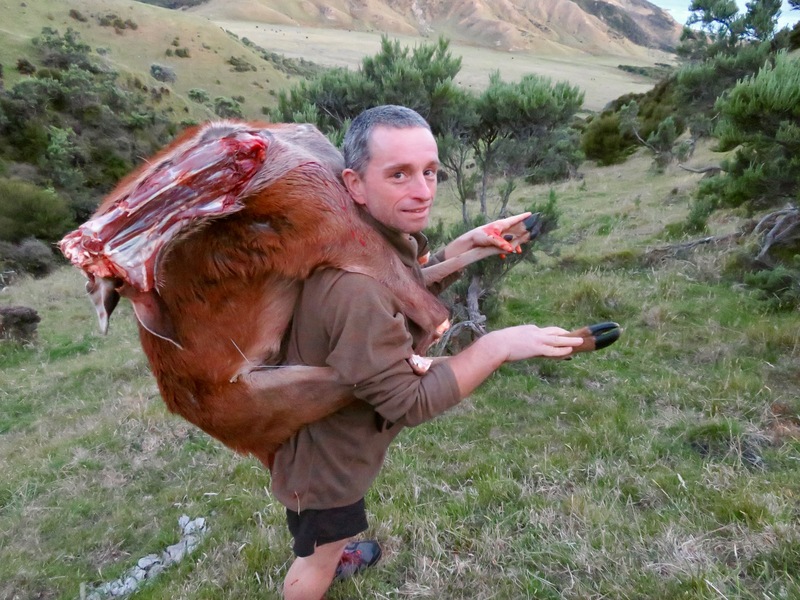 Chris the English lad is flying into the Kawekas' with me next week and will likely get a shot then, so this was Sam's trip to get a deer. For the evening hunt I let Sam carry my 7-08 and I had my 300saum just in case. If we didn't gat one last night we would try again in the morning (this morning). I parked the truck on the side of the road and encouraged them to shut the doors quietly because the scrub came down to the road and there could be a deer about. Before I had my pack on Sam was scanning with the binos and immediately announced "I can see a couple"! First time looking for deer and he spotted 2 in 20 seconds. The wind was up our arse and those 2 soon disappeared but I wasn't fazed because it was early in the evening and we had plenty of country to cover. 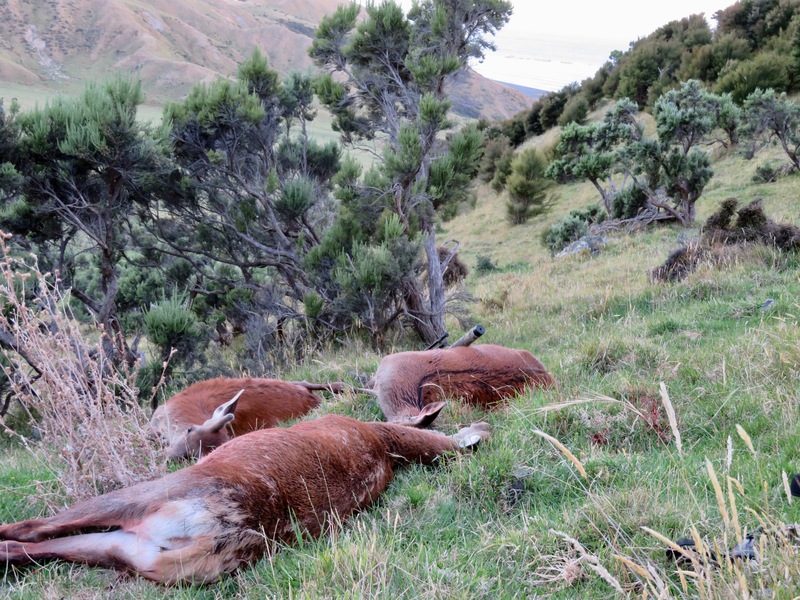 I led the lads on a stalk of a couple hours doing a big loop so that the best of the evening was spent hunting into the wind and not long after getting to where I wanted to be I spotted 3 deer up in the scattered Tawhine about 800 yards away. The stalk was on. I wanted to get Sam into a good position of no less that 200 yards and this took 45 minutes to achieve, but when we sneaked into position the deer were no where to be seen. I glassed the opposite face where they had been but nothing. So I moved forward a bit to see lower down and a yearling bolted into view heading for cover. So I did what every selfish damn guide like me would do - and shot it on the run myself. Both of the lads who were behind me saw all of this happen. My shot stirred up some action and a hind and yearling ran into view so I whipped my day pack off and threw it Sam who was trying to get a bead on them without a rest. With instructions from me to not to shoot until they stopped and to shoot the back one (the yearling) I shouted out an "oi" and sure enough they both stopped for a look. "Bang" from the 7-08 and the yearling fell to a great shot through the shoulder. 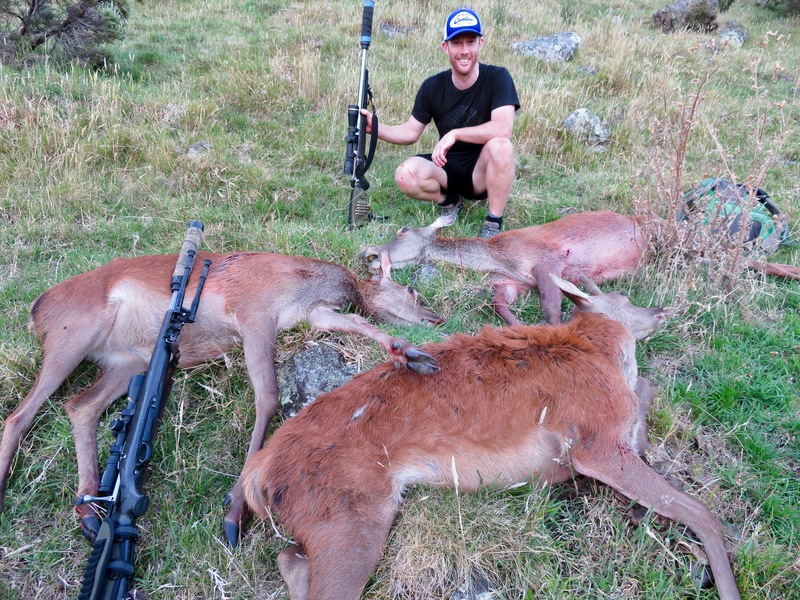 These 2 had been well out from the bush edge and the hind still had a yearling in tow so I was pretty sure the hind wouldn't have a fawn so I said to Sam "shoot the other one too". "Bang", and she fell to a very clean lung shot. Then 2 more deer ran into view and I was pleased to hear one of the lads say "we have shot enough, eh". The first 2 shots Sam had ever fired from a rifle and he had shot 2 deer! We made our way around to the deer and as per my educated guess the hind was dry (and a bit skinny). The lads were in shock and awe about what had just happened and were sort of pleased and sad. Mixed feeling, they said. That was good. They enjoyed watching me butcher the hind and stuff her into my pack, and were un-suspecting as I took a second approach with the 2 yearlings. Its was my secret plan to take a bit of sting out of them...turn the deer into a pack, give one each, and turn them into mules. When I told them what I was up to they were both up for it and once I got them loaded and going they both bolted away with me in their wake with the hind, 3 packs and a rifle. They carried their 2 deer for an hour until we got to a spot where I could get my ute to so they were spared the last 30 minutes. A gutsy effort by a couple of tyros! This morning I got up at 6.30am and butchered the 3 deer while the lads watched and then we had breakfast, cleaned up and hit the road. There had been a lot of chatter on the way over - I think Sam talked all the way from Wellington to Martinborough, but on the way back he was asleep in the back of the ute before we had travelled half an hour . It was good effort and I greatly enjoyed myself. 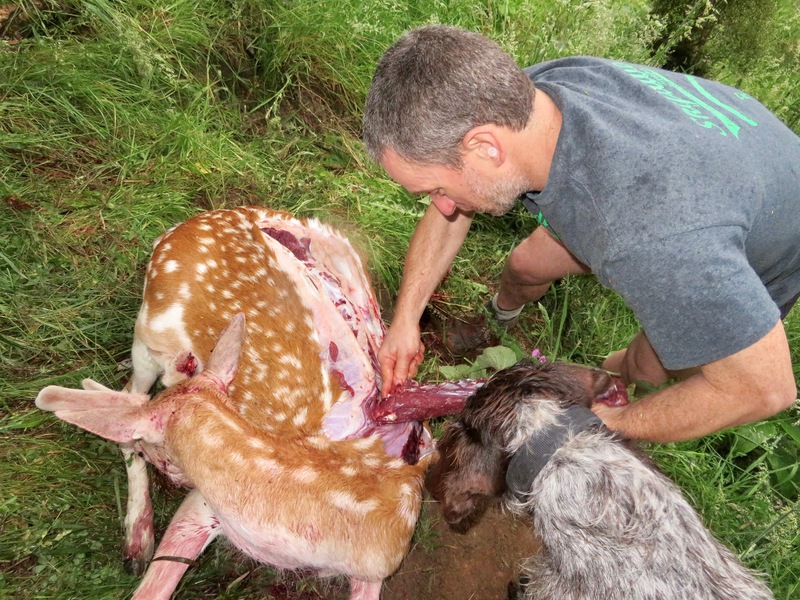 Now I have to work out how I'm going to get a deer's worth of sausages and salami from Wellington to Auckland. hillclima, Norway, jakewire and 40 others like this. 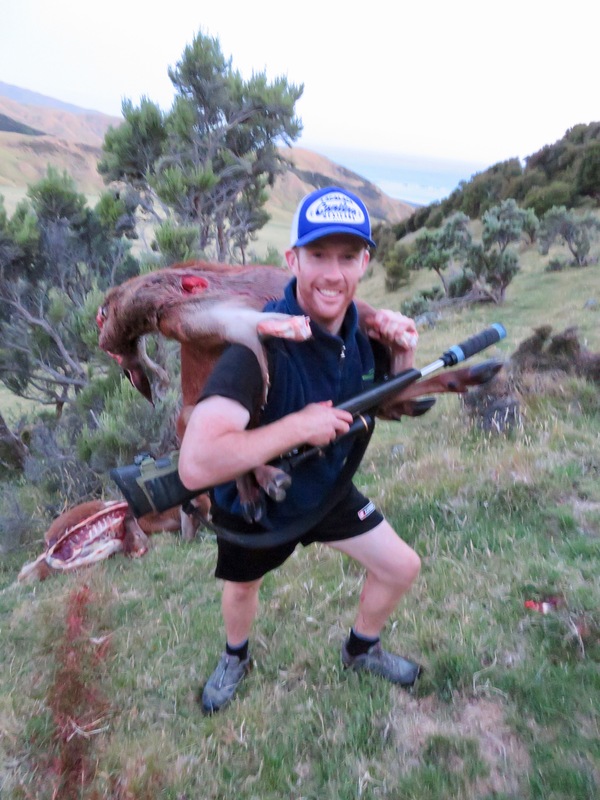 What an introduction to hunting in new Zealand., couldn't have asked for more! Tahr, gadgetman, stingray and 1 others like this. well done the boys look happy. Awesome, those young fella's are sure lucky to have a guide like yourself and some nice country to hunt. Well done everyone, memories are made of times like this. Awesome Bruce no other word for it. Tahr and GWH like this. Liking your work Tahr. Well done. fresh tender eye fillets for breakfast...man the farts in the wagon would be potent lol. hope you kept window open for Tilly to breath? a couple of poly bins from local fish n chippie will keep your salamis etc cold. plenty of freight companies run down to welly each day and come home empty...if you can talk to driver and arrange it to be there ready to collect it might just cost you no more than a salami and bag of snarlars. I've found a downside to guiding The CDS on my 7-08 Sam used has been knocked around to 17 minutes, and I don't know which way to wind it back. Bore sight it will tell you. I took our visitor "Chris the pom" out for a hunt last night. In the rain - we had driven a long way for the hunt so we pushed on. Got him lined up on a young Fallow at 318 yards with my .243. Bang flop with a high shoulder shot! Like Sam, it was his first ever shot from a rifle. I also got Chris onto the knife and he didn't make a bad job of that either. veitnamcam, Brian, gadgetman and 5 others like this. Fantastic Tahr. You should have told him he could take the ear plugs out for the knife work. It is somewhat quieter than the bang before the flop. Ha ha ha ha my mistake.